Well hello to everyone out there and a happy Monday to you all...and you know what Monday means...This Momma's Meandering Mondays #9! So come on in, meet some amazing folks, find some awesome and tasty treats, and best of all make some friends and grow together! 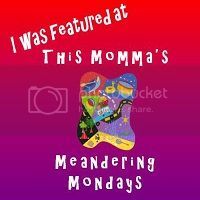 This month, I am asking my lovely co-hosts to pick their favorite post from those linked up each week so we can showcase them as "This Momma's Marvelous Meanderers", so be sure to check back next Monday so see if you have been featured! So now on to feature some of our amazing link-ups from last week! We had some yummy recipes, great tips and tricks, DIY, and some amazingly, beautiful and touching stories. I know I certainly had a hard time picking my fave...so without further ado...on to our featured link ups! Jessica's favorite from last week came from Angela who blogs at My Personal Accent - http://www.mypersonalaccent.com/crowdfund-campaign/ Saying, "I am all for non-profits and have also looked into crowdfunding myself. It's a great organization to help with a cause! Brittnei's favorite came from Dara who blogs over at Living My Someday with her post - http://www.livingmysomeday.com/2013/08/a-lil-link-love.html Saying, "I really loved this post!" My favorite came from Dawn and her blog Thank You Great Spirit - http://www.thankyougreatspirit.com/2013/08/a-bag-oapples-makes-applesauce.html I remember smelling the house any time that my mom or grandma would make homemade applesauce, and it was always delicious! Thank you so much for sharing, I think that I am going to have to make some...applesauce is about the only fruit that lil man will eat. Okay, are you ready to party?!? Well then, without further ado...I would like to welcome back my amazing co-host's for August, for their final week of co-hosting This Momma's Meandering Mondays! It has truly been amazing to be able to work with such wonderful ladies; I have to say that I am honored to have met you all! Brittnei Washington @ Homemaking With Style - “Brittnei is a bubbly wife to Harroll Washington and mom Harroll, Jr. who loves homemaking, beauty, decor, crafts, football and healthy living. She and her husband Harroll have a home business helping people virtually and in person to lose weight and live healthier lifestyles. They sell a line of all natural products to help people tackle weight loss and obesity-related health conditions as well as a natural serum to help with wrinkles and stretch marks. If you are interested in learning about these products, you can go to her website by clicking here." Stop in and say hello to each of these wonderful ladies, because everyone enjoys a little comment love! Feel free to "meander" by some fellow bloggers and find a new recipe to make for the family, a helpful blogging tip, a funny story to read, and best of all a new friend to make! There are really only a few rules that I would ask you to follow, pretty simple ones really... 1. Link up your favorite story, recipe, photo, or helpful tip; please keep it family friendly. 2. Please follow our Host and Co-host's 3. Please find some new friends to follow, remember the more you follow the more followers you will have. 4. Be sure to leave some comment love, to get it in return. 5. Grab our badge and display on your blog, sharing the love is what it's all about. Then meander through the links and make some new friends, find some amazing and useful tips, and maybe even a new treat to try! 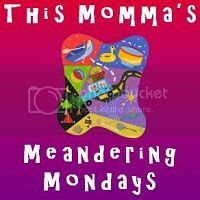 Are you interested in co-hosting This Momma's Meandering Mondays? If so, please drop me a line at ssgannett@gmail.com. I would love to have you along for the ride! You can also check out my sponsor page for more info.